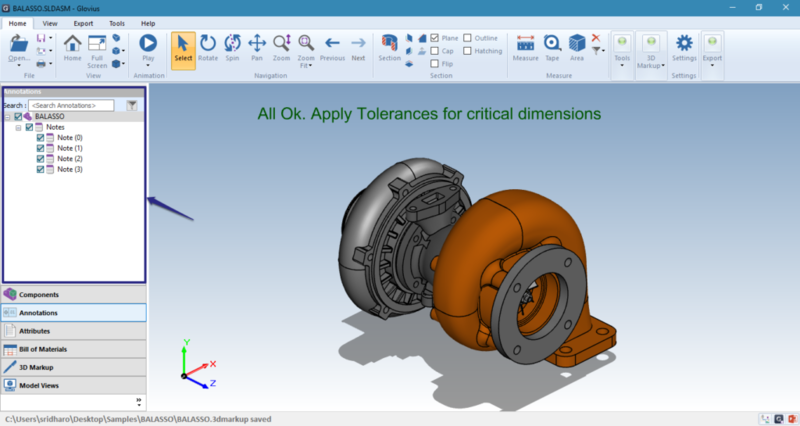 Glovius is a modern CAD viewer with support for all popular 3D CAD file formats. 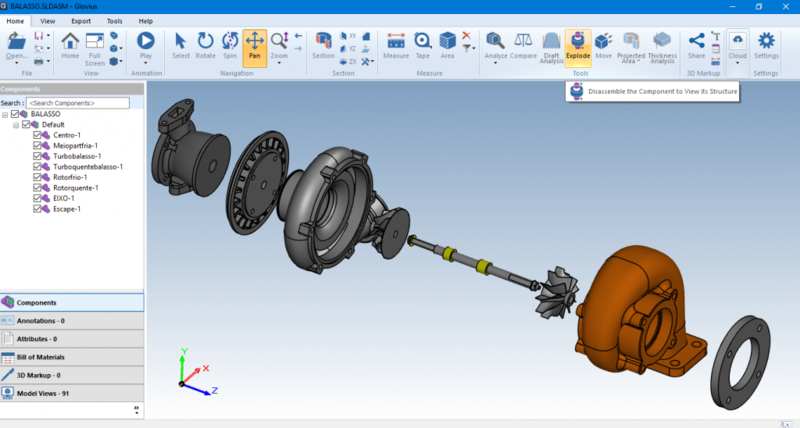 Using Glovius tools and functions, users can view and quickly analyze 3D CAD parts and assembly components. 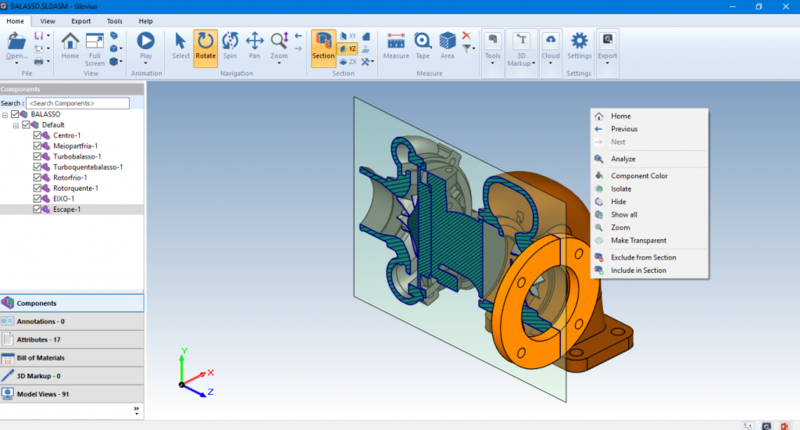 Glovius is a modern 3D CAD viewer with a simple and familiar user interface. 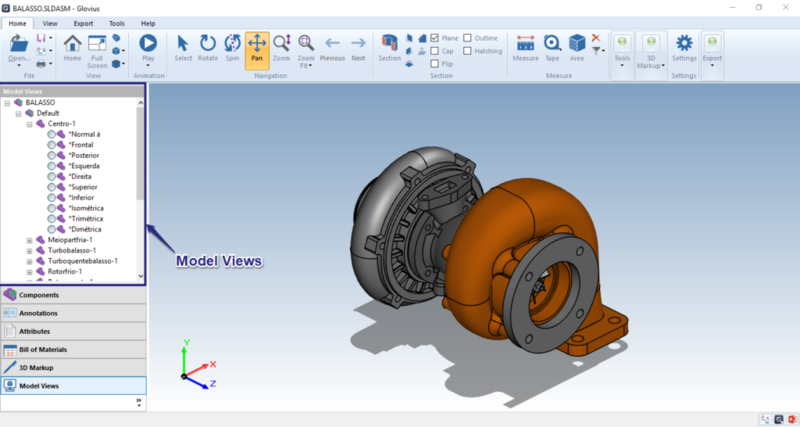 Use Glovius to open CATIA, Pro/Engineer, Creo, NX, Solidworks, Inventor, STEP/IGES and SolidEdge parts and assemblies at a fraction of the cost of CAD licenses. Glovius is based on the familiar user interface based on Microsoft Ribbon UI. All tools and functions are grouped according to functionality and visible to the user. The UI is categorized into various tabs as per the function name Home, View, Tools, Export and Help. Glovius automatically configures a 15-day trial license upon installation. Contact us at support@glovius.com to extend your trial license. We offer both subscription and permanent licenses. Permanent licenses are available either as a node locked ( configured to a machine ) or floating ( configured on a license server ). Subscription licenses are valid for a year and are renewed annually. Please visit our online store for more details. Please mail us at support@glovius.com with your questions and suggestions and we’ll be glad to assist you. Can I export the 3D files to other formats? Glovius provides a number of options to take sections of 3D models. 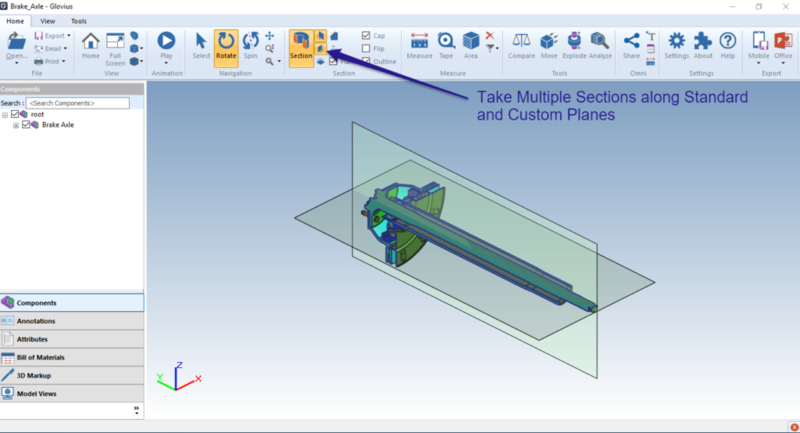 You can create sections along a single plane or multiple planes (upto 3) or along custom planes. You can also change color of the section planes along with cap and outline colors in the Settings Dialog. Click on the Section Button to take a section of the model. By default the component is clipped along XY axis. Click on the XY,YZ or ZX plane buttons to section along respective axis. Clicking a second plane with an already active section further sections the model along the new plane. Click on the Custom Plane button to section along planar surfaces or the reference planes existing in the model. Apply hatching patterns for components while Sectioning. 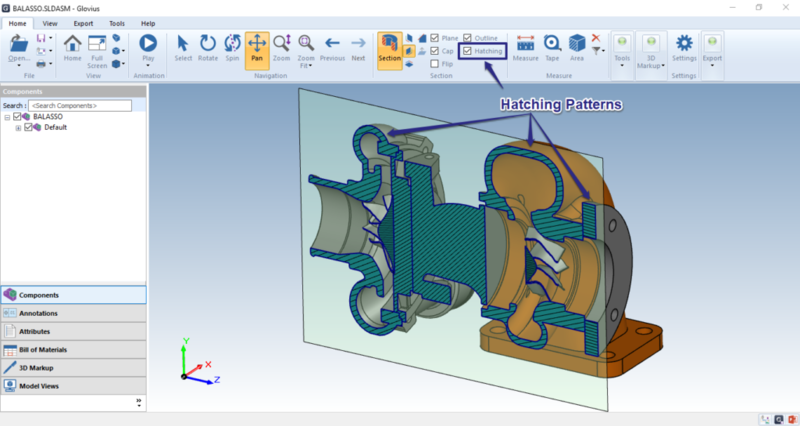 Hatching patters are especially helpful in CAD assemblies in highlighting the component boundaries and aiding in the visibility of individual parts of the assembly. You can exclude some components from a Sectioning using the Contextual Menu. Select a component, Right-Click and Choose the “Exclude from Section” to view the full model. This is useful visual aid for performing integration analysis in Glovius. Glovius supports different types of measurement. 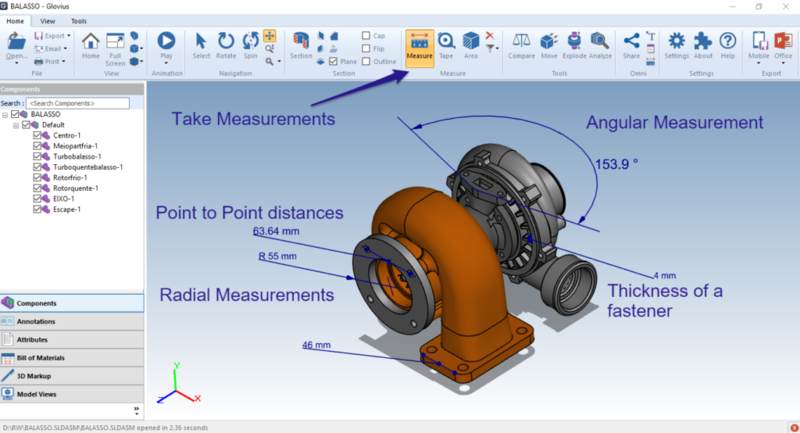 You can measure points, linear dimensions and radial dimensions. Tape Measurement – Tape Measure tool helps you to calculate the length of a component along a line. It is typically used to calculate the total length of a wire harness or the curved edges of asymmetrical components. Surface Area Measurement – Area measurement tool helps you to calculate the total surface area of the selected surface. By holding the Control key during selection, you can calculate the area of multiple surfaces. Analyze – Analyze is a tool to quickly give you a snapshot of the components top attributes. This includes the bounding box dimensions (also called the envelope dimensions or extent dimensions), density, mass and surface area of components along with BOM attributes like instances in the assembly. Move helps you re-arrange your assembly components along the coordinate system to help you interrogate your assemblies effectively. 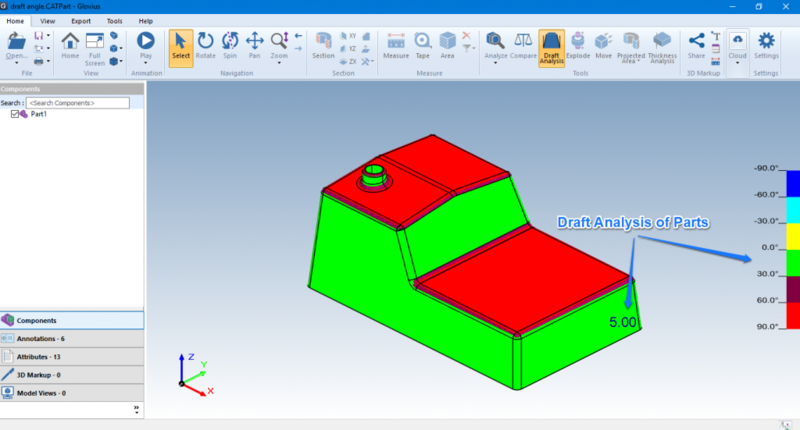 Draft Analysis tool helps you to calculate the draft angles made by all surfaces of the components with respect to a reference plane. The results are displayed in 3D with colorized surfaces to categorize and identify the surfaces based on the draft angle values. You can also hover the mouse pointer on a particular surface to get its draft angle. 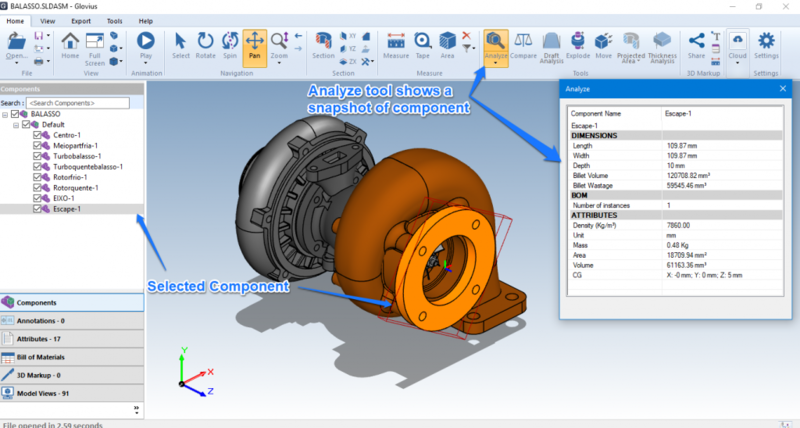 Explode tool allows you to quickly analyze the components in an assembly. The sub components of the assembly are arranged along the axes. Projected area helps you to calculate the area of the component projected at a plane. 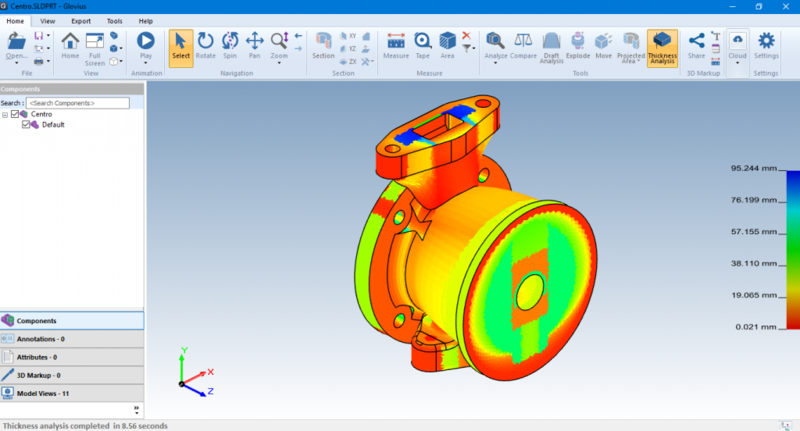 The area values can be useful in a variety of applications like calculating the casting pressure etc. The thickness analysis tool helps you to understand the material distribution in the part and hence check for the thickness and/or thinness of the part at a particular region. It helps you in optimizing the design. Read more about thickness analysis here. 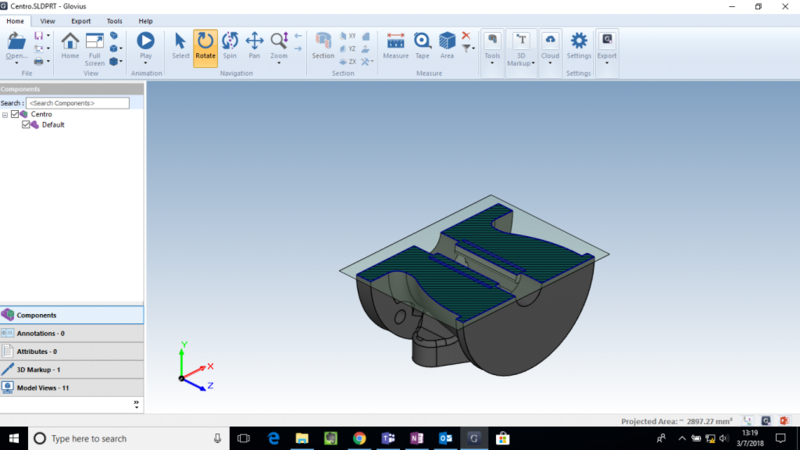 As the adoption of mobiles in the workforce continues to rise, we have now provided an option to directly send your CAD parts and assemblies to your mobile devices. Using the Push to Cloud tool, you will be able to access your CAD parts and assemblies from mobile devices using our free iOS and Android apps or by logging in to our web app. Model views are stored views already existing in the component. You can also create Model Views to draw attention and provide context to localized components and/or features. In a model view, you can save a view state, take a section and add markups. Shaded With Edges Mode – The component is displayed in original colors with all edges highlighted. It gives the best display with a small offset to performance. Shaded Mode – The component is displayed in original colors with no edges highlighted. Wireframe Mode – Only the edges of the components are displayed. This mode helps you to quickly understand the underlying design of the component. This mode has the best performance among the three render modes. Component Visibility can be accessed from the View tab. The set of tools in this group helps to show, hide or focus on a specific component. This tool helps to focus on a specific component and hiding other components in an assembly by hiding all others. This tool changes the visibility of the component and hides it. This tool shifts the view to focus on a selected component by zooming in to the selection. This tool shows all the components in the assembly. This tool applies transparency to the component. Select a component and click the ‘Make Transparent’ button. To revert to the original display of components, click on the ‘Home’ button. This tool progressively applies transparency to the component.This functionality quickly helps you visualize the entire assembly and the spatial relationships among various components. 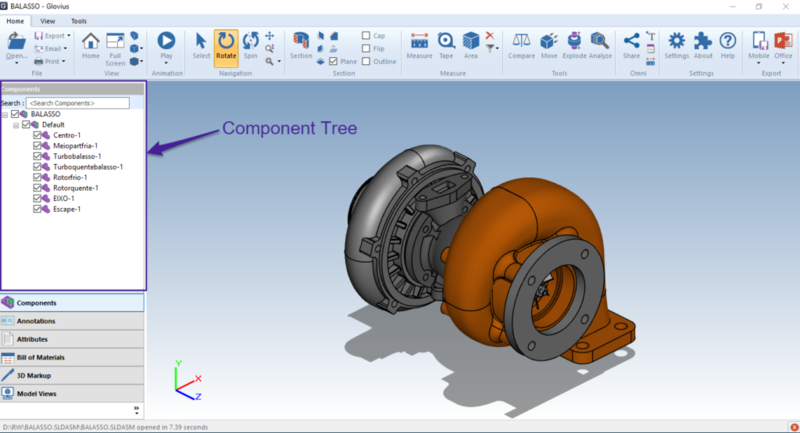 Select an assembly or sub-assembly from the Component Tree and click on this button to apply varying transparency values. This tool instantly applies a standard set of colors for increasing the visibility of various components. Select an Assembly either on the Render area or a node in Structure tree to color the assembly. This labels displays the component tree of the model. It lists all the components within the model in a graphical tree. Components can be selected, deselected or shown/hidden by operating the respective component node. This label lists all the PMI, GDnT, markups and notes that are available in the model. You can also change the visibility of each note using the check box. Attributes list all meta data associated with the file. 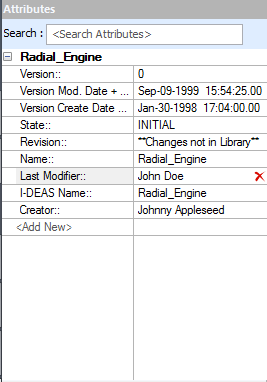 If the Design team adds any specific piece of information in the file, it is listed in the attributes. The most common attributes of a 3D Model are file created date, time, author etc. 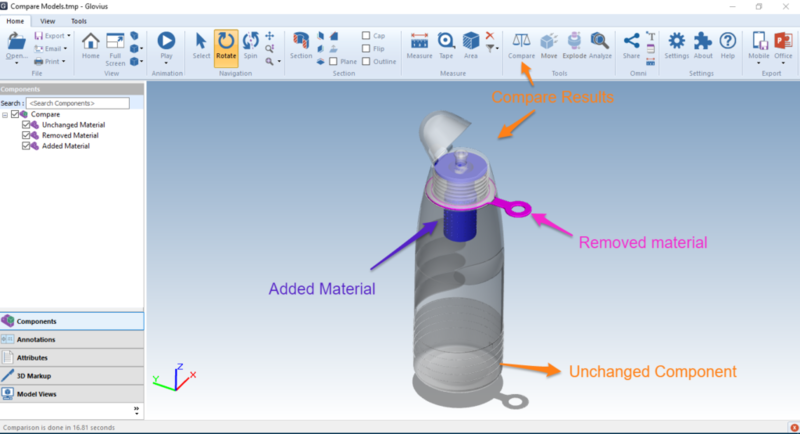 Bill of Materials is used in a number of process steps in producing a component. It is used for procurement-supplier tracking, system integration and quality. Using Glovius, you can save BoM in a number of ways. To accommodate the various design practices, you get the BoM of top level assemblies, all contained parts or all sub-assemblies. 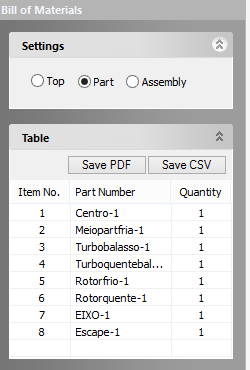 Further, you can export the BOM to CSV or PDF format for use in downstream processes. When you export to PDF format, we list the components with a image of the component for better references. Model Views help you to create specific contexts for your model and focus on a particular view of the model. Model views can include text markups and dimensions. Model views are persisted when exported to JT format. 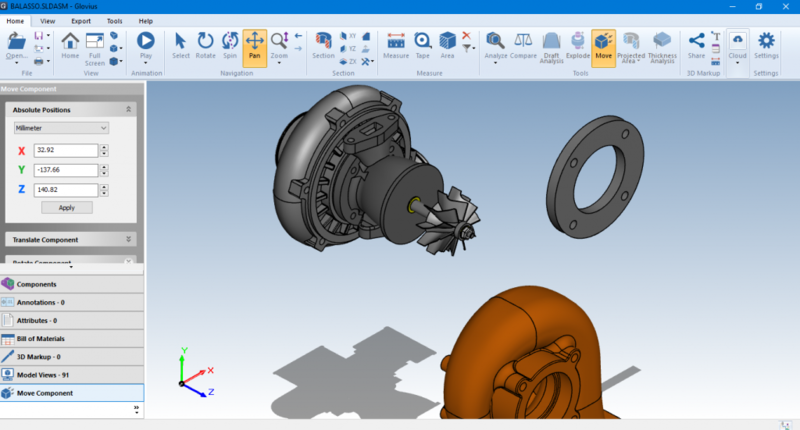 Using Glovius you can export your CAD Models to different formats. Glovius can export your 3D CAD models to Image Format, 3D PDF, STL and .Glovius format for use in Glovius mobile apps. You can also export reports for quick collaboration and sharing. Export your 3D model to a HTML file containing the geometry data, BoM and attribute information. This HTML file can be viewed in modern browsers. Read more about this export option here. 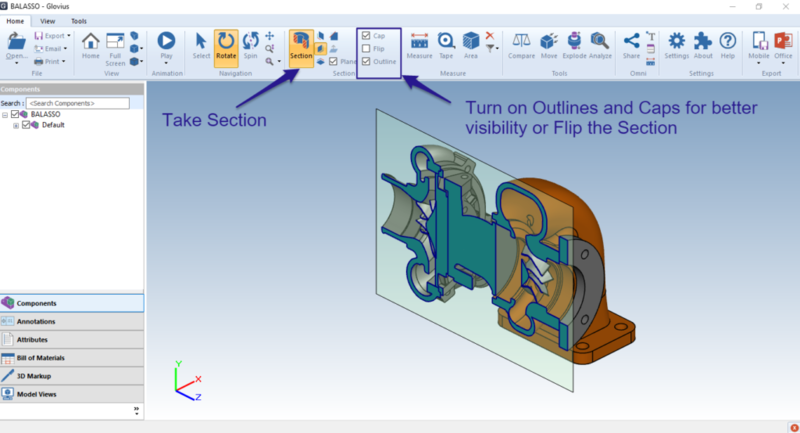 Export your 3D model to a Powerpoint file with all Views and and the component analyse information. Further you can set custom themes from the Settings dialog. Using Glovius you can generate BoM reports of your CAD assemblies with a single click. Glovius also allows you to customize the BoM report to list the hierarchy either according to the Product Structure, simple parts list or at the sub assembly level. The report can be exported to either a PDF report or CSV format. BoM CSV report : This report contains the list of components along-with their quantity and all attribute information of the components. Export the 3D model to a PDF document report containing all information that is typically needed for collaboration. With a single click, you can generate the 3D data, Attributes data and BoM report in a single PDF file. Download this sample 3DPDF report and View the contents in Adobe Reader. We support 3D Mouse from 3Dconnexion. 3D input device development tools and related technology are provided under license from 3Dconnexion .